CEE’s activities in Jammu and Kashmir are coordinated by CEE Himalaya, the Himalayan initiative of CEE. CEE Himalaya was established in 2002 coinciding with the ‘International Year of Mountains’, though CEE’s environmental education outreach to the state dates much before that. The focus of CEE’s activities in the state is on creating and increasing awareness and understanding of environmental issues in fragile ecosystems of Indian Himalayan region and to inculcate environment friendly attitudes through education for sustainable development (ESD). Jammu Kashmir is has three distinct geo-climatic zones based on which the state has been divided into three administrative zones – Jammu, Kashmir and Laddakh provinces. CEE’s programmes are operational in all the 3 provinces. 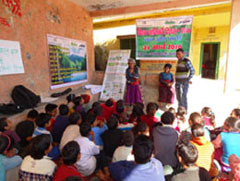 On the occasion of International Day of Forest on March 21, 2016, CEE Himalaya utilized the opportunity to raise awareness among people of Kuroli village, Uttarkashi district, about the services provided by the forests and drawing attention towards the urgency of increasing the green cover. 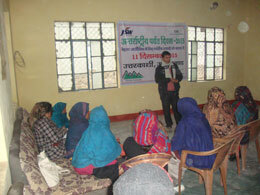 The event was hosted in partnership with JSW Foundation, observing an overall participation from 60 community people. An array of activities like discussions, open dialogues, plantation, and games were conducted. Discussions and open dialogues with the communities took place. Participants stating that the each family in Kuroli community has adopted some patch of their traditional forests where cutting even a single branch from any tree is not permissible. CEE team promoted the plantation of traditional species to meet the increasing demand. Women of the community planted saplings of native species like Baans (Bamboo), Deodar (Cedrus deodara), and Oak during the event. At the end, Kuroli community took pledge for dedicated and sincere effort for preservation of forests and trees. Under the leadership of CEE Himalaya and JSW Foundation, Kuroli village celebrated International Women's Day in which around 50 women participated. The event began by wishing one and all and stating that it is an important day to acknowledge the struggles and achievements of women residing in mountains and to look forward for bringing about a behavior change towards the empowerment of women in the community. An array of activities involving recreation, interactions and discussions took place along with applauding the change agents in the Kuroli community. Women described the plight of Garhwali women through traditional folk songs and traditional folk dances. Discussions were conducted on personal hygiene, health issues, environmental and climate change impact on women, education, safety and security, role of women in developing an empowered and sustainable mountain community. During interactions, women highlighted their frightening experiences while fetching water and collecting fuel and fodder which are aggravating due to brunt of climate change in the entire mountain ecosystem. At the end, President of Mahila Mangal Dal appreciated and thanked the organization for providing women with an opportunity to celebrate the event. 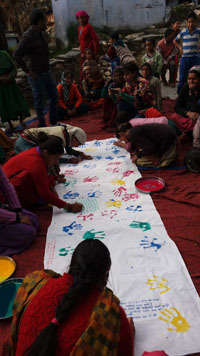 It was followed by pledge writing about exercising women rights and working together to achieve change. 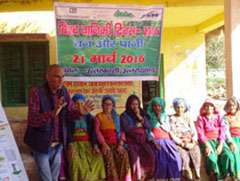 CEE Himalaya organized an event with Valmiki Basti in Uttarkashi district of Uttarkhand to mark International Mountain Day 2015. Promoting mountain products for better livelihoods is the theme chosen for this year's celebration of International Mountain Day. The aim of the event is to invite the Valmiki community to take part in the celebration of International Mountain Day and to discuss the local environmental issues and create awareness on preservation of the environment especially in mountain ecosystems. The livelihood of majority Basti people is dependent on swine and poultry farming which consists of 10% households with toilets of their own. There is no proper drainage system in the Basti, all the sewage is drained into river. Open defecation is a common problem here along with fewer Municipality sweepers to carry out the cleaning. The celebration aimed to encourage local communities to preserve the environment by sensitizing them to mountain issues. Since the economy of the people depends primarily on tourism and agriculture, it is imperative to protect the fragile ecosystem by encouraging sustainable practices. On the occasion of International Mountain Day, community was informed about basic hygiene and sanitation measures that are essential for the community. The concept of Nirmal Ganga- Clean Ganga was also introduced to the community and actions to support this initiative were outlined with the help of community. While discussing about natural disasters, the community was also briefed on of disaster risk reduction and the importance of community participation in it. State of Jammu & Kashmir has 22 districts falling in 3 administrative regions – Jammu, Kashmir and Ladakh. There are total 14,938 schools in the state of which 5,486 are NGC schools in J&K. 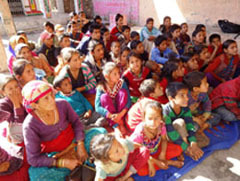 On the 22nd January 2011 a Sate level launch of PM programme held at Jammu. Education Minister J&K was the Chief Guest on this occasion who has assured for full support to the programme in the state. WWF India (J&K Chapter), Centre for Environment Education and Training (CEET) and Arjun Youth Club are 3 NGO partners for Jammu province. 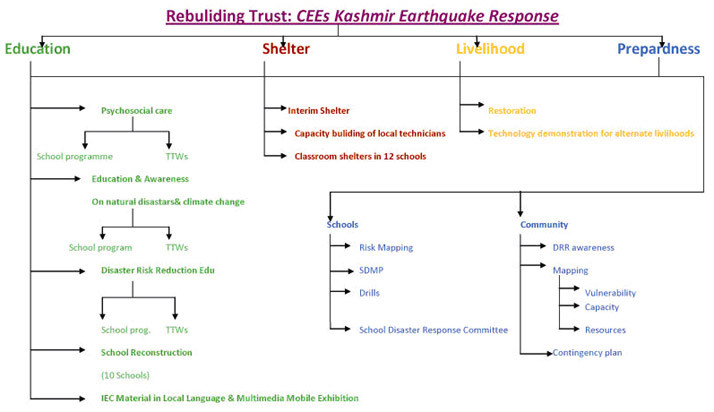 CEE responded to Kashmir 2005 earthquake in phase wise manner. In the first phase main focus was on education, shelter and capacity building to meet the immediate rehabilitation needs in Baramulla and Kupwara the worst hit districts. Phase II addressed to mid- and long-term rehabilitation and recovery needs. CEE is now working on school safety and disaster preparedness in five disaster prone districts. 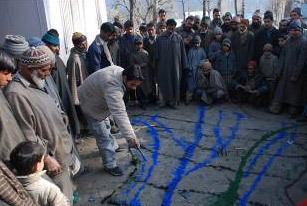 CEE has also taken up community based disaster preparedness and village level contingency planning in Baramulla, Kupwara, Bandipora, Ganderbal and Srinagar districts. 'Hardy Mountains, Fragile Environments'— a collaborative initiative of CEE and Wildlife Institute of India focused on mountains, their biodiversity values, interaction in the ecosystem - impacts and consequences, and raising conservation awareness with a focus on snow leopard. Aimed at sensitizing teachers and students on issues related to highly endangered snow leopard and its habitat an educational package comprising of a set of 4 posters, a teachers' booklet and stickers have been developed. Teachers from Leh & Kargil districts of Ladakh region, J&K were trained for effective use of IEC material. CEE initiated Dal Lake conservation through education and awareness in 2004 with support from Union Ministry if Human Resource Development. Students, teachers, Principals and Headmasters from 20 selected schools falling within the Lake and the periphery were chosen, eco-clubs formed in schools, teachers trained on monitoring water quality and understanding the relationship between waste management, water quality and people's health & livelihoods. This initiative was further scaled up to sensitize and motivate major stakeholders for instance the youth and women, community leaders, houseboat and shikara owners. The initiative aimed at making people understand the connection between their health, livelihood and prosperity with the health of Lake and to motivate them for conservation. CEE Himalaya organized and educated about 300 residents of Dal Lake particularly the women to sensitize them about the grave problems of water pollution and related health, hygiene and sanitation issues. Relevant education material in Urdu language was developed for dissemination. Concerned agencies responsible for catering the civic amenities to the lake dwellers were also involved. Appropriate technologies related to waste management and water purification were being demonstrated and popularized. CEE helped the Ministry of Environment & Forests; GOI in the integration of environmental education (EE) in school curriculum across 27 states through Strengthening EE in the School System (StrEESS) programme. 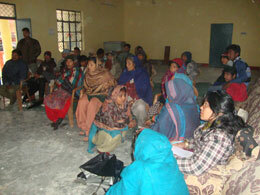 CEE Himalaya implemented the programme in Jammu & Kashmir. It included help facilitation of revision of text books, training of teachers, resource persons and concerned personnel of the education departments like DIETS, SCERTs and State Institute of Education. A Resource Book on ‘Environment, Economy and Ecotourism in Kashmir’ for the teachers of standard 6-8 developed in partnership with the local NGO ‘Global Green Peace’. Two days ‘Traveling Film Festival’ at Srinagar, Kashmir to increase awareness amongst more than 500 students, youth and general public on the environmental issues and to sensitize them for conservation. Joy of Learning in Ladakhi was completed and dissemination was done to education department, NGOs and institutions this year. Supporting local NGOs through capacity building programmes and in developing locale-specific education and communication material. Schools from Ladakh were involved in the Remote Sensing Education & Awareness for Remote Areas Children (RESEARCH) programme. Under Clean India programme organized Solid Waste Management Awareness Workshop. Activities creating awareness about the local environmental issues and conservation requirements through celebrating important days like International Mountain Day, International Biodiversity Day etc.